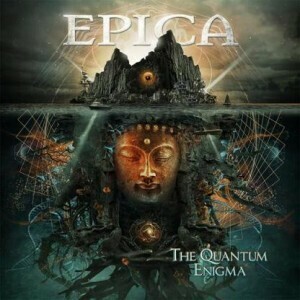 Epica is back with its seventh studio record in eleven years, and The Quantum Enigma might just be the band’s strongest output yet. Epica sounds more consistent, more thought-out, and a whole lot heavier than before, and delivers nearly seventy minutes of addicting symphonic metal. After the short overture “Originem”, the band portrays what makes it stand out over the next two tracks. “The Second Stone” sounds heavier and tighter than one might have expected after such an epic introduction, but Simone Simons’ vocals sound quite confident. Some people might argue that the chorus is too soft, but I adore its floating and almost spiritual touch to contrast the punching verses. Simone Simone sounds truly angelic in this song. “The Essence Of Silence” opens with melancholic piano and string sounds, and Epica sounds more cinematic than ever on this album. “The Essence Of Silence” takes a similar path as its predecessor: an apocalyptic atmosphere, beefy riffs, and solid growls kick in before Simons’ contrasting vocals lead to an enlightening and spiritual chorus. Once again, the contrast between the beauty and the beast works so easily. Epica really sounds like itself and not like any other symphonic metal band on this record, and this is very important in a scene with so many exchangeable bands. Most songs follow the beauty-meets-the-beast approach, and hit hard like the destructive “Victims Of Contingency” which is one of the hardest tracks ever written by the band. Other highlights include the epic instrumental “The Fifth Guardian – Interlude”, with its majestic Asian folk influences that remind me of The Last Successor, and the calmer, more classical and gracious symphonic metal hymn “Omen – The Ghoulish Melody”, which convinces with its powerful chorus. The two longer songs on the record, “Sense Without Sanity – The Impervious Code” and “The Quantum Enigma – Kingdom Of Heaven Part II”, have their precious moments, but are also a little bit overlong here and there, needing multiple spins to open up. I would say that the shorter and straighter tracks on the album work much better in general than the overambitious epics. Epica might not reach the quality of Xandria’s new release, Sacrificium, due to a extra length in the second part of the album but, it comes extremely close. I would have thought better of The Quantum Enigma if the band had focused on nine or ten tracks and a total length of around fifty minutes instead of inflating the record here and there. However, the first half of the record is really excellent. The musicianship is technically stunning, the production is powerful, the song wrtiting finds the right balance between grace and heaviness, and even the cover artwork is a stunner. Symphonic metal fans should definitely purchase this one, as I believe Epica has delivered the best effort of its career so far. 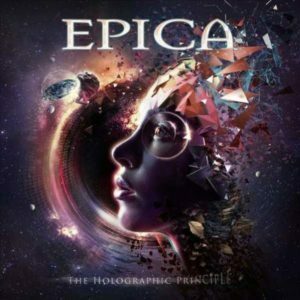 Straight to the point: Epica’s new release, The Holographic Principle, isn’t a bad record by any means, but instead of adding anything new to the band’s sound, it only offers more of the same sound, and feels like a less inspired version of its forerunners. It becomes painfully obvious that the band is running out of ideas if we compare The Holographic Principle to its direct predecessorThe Quantum Enigma. Two years ago, the band opened its record with a short cinematic track called ‘’Originem’’, which was mostly instrumental and only featured a few lines of Latin lyrics. This time, we also get a similarly instrumental track with Latin lyrics entitled ‘’Eidola’’. Even the run time of both these intros is around two and a half minutes each. The second track on the predecessor was the powerful, speedy, and uplifting “The Second Stone”, focused on Simone Simons undeniable vocal skills. This time around, ‘’Edge of the Blade’’ does exactly the same thing, and comes across as energizing, joyous, and tight after the intellectual overture. Again, both tracks have an identical running time right around the five minute mark. Two years ago, the third track, ‘’The Essence of Silence’’, was a little more sinister and featured more prominent death metal growls by band leader Mark Jansen in combination with Simone Simons’ angelic performance. This beauty and the beast approach on the third track can, again, be found on ‘’A Phantasmic Parade’’ where the two share vocal duties. Once again, there is only a difference of eleven seconds in length. I could continue to point out extremely similar structures and formulae between the two records (Such as how the album title and cover artwork feature similar ideas, and how the production team is nearly the same), but I’d guess you are getting my point by now. Is there anything bad about sticking to a winning formula? No, it isn’t necessarily a negative thing. Still, it makes a direct comparison between the records an inevitability. In almost every case, The Quantum Enigma features better tracks when compared to The Holographic Principle, and also leaves a stronger, more favorable overall impression. Everything was more impressive the first time around, and where The Quantum Enigma proved to be a great record, The Holographic Principle isn’t offering much more than slightly above average material. The best tracks of the new release can be found in its middle. ‘’Beyond the Matrix’’ features classical instrumentation and uplifting choirs of the greatest kind, and the chorus is absolutely heartwarming. The reduced modern instrumentation in the verses give Simone Simons the occasion to really shine in this emotional track. This is maybe the catchiest tune on the album. ‘’Once Upon A Nightmare’’ is also a track that takes its time to add one classical instrument after another in the intro section instead of bombarding the listener with multiple tracks. In this melancholic ballad, Simons’ enchantingly soft and soothing vocals stand out, and she delivers what may well be one of her greatest performances ever. The transition to include modern instrumentation works very well, and the soft tune becomes a power ballad where Simone sings her heart out. This is clearly the greatest ballad on the record, and one of the best songs Epica has ever written. ‘’The Cosmic Algorithm’’ is one of the record’s most diverse tracks, its pace constantly shifts from restrained mid-tempo parts to crunchy up-tempo passages. Majestic choirs and stripped-down, harmonious symphonic metal support Simone, while harsh outbursts supported by Mark Jansen’s angry and sinister organ constantly give battle and push the track forward. This song perfectly represents the best and different facets of Epica in a single song. If I had to chose one track to introduce someone to the band, this would be my pick. Again calling the predecessor to mind, the special edition of The Holographic Principle offers a short additional disc where the band reinvents some of the new songs without the usual epic bombast. These tracks open up with a folkier sound, dominated by acoustic guitars inviting you to dance around a campfire, and with a few jazzy parts that make you feel as if you were dancing with a beautiful woman in a hot speakeasy in Chicago during the prohibition era. This additional disc proves what great, open-minded and versatile musicians Epica are. If I were feeling mean, I would say that the five bonus tracks are more interesting than the entire regular record, and I would like to hear some of this diversity on the regular version of the band’s next output instead of the almost constant bombast that is at times hard to digest on The Holographic Principle. A more balanced, differentiated, and varied record would be a welcome alternative to yet more of the same on a slightly decreasing level of quality. In the end, my honest recommendation is that casual symphonic metal fans don’t need Epica’s newest output if they have already purchased The Quantum Enigma. Even if you haven’t purchased one or the other, I would clearly recommend The Quantum Enigma because it includes both better individual tracks and an overall more balanced sound that’s a bit less overwhelming. Epica missed the occasion to reinvent itself after its career highlight two years earlier, and to keep the momentum going by fine-tuning what made that last album so great. In the end, The Holographic Principle is an entertaining, above average record. However, after the band’s prior masterpiece, it comes as a minor disappointment. I would only recommend this record to avid symphonic metal fans and dedicated Epica enthusiasts.